I was requested to donate some cards at the local Children’s Hospital where I live. I was supposed to make it very simple, kid-friendly with no sequins or glitter. Since Valentine’s Day is fast-approaching, I decided to use the new Love Bites stamp set by Newton’s Nook Designs. 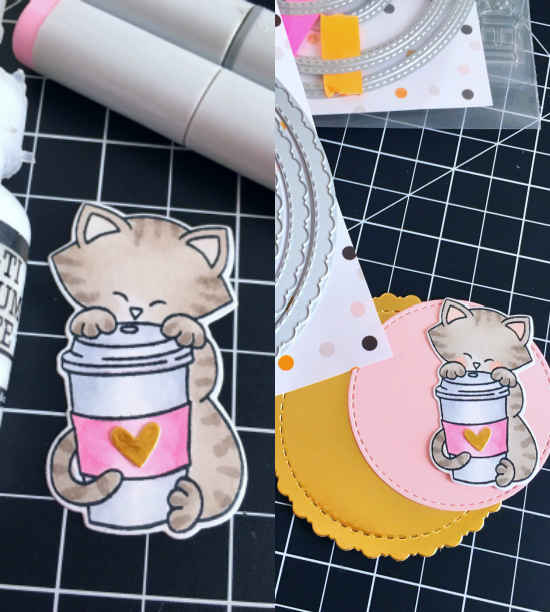 The Love Bites stamp set is so versatile, you can create so many different projects using this set. It doesn’t have to be Valentine’s-related. You can also use it to make cute little notes to your kids to add to their lunchboxes, or just leave them notes to brighten their day. Thanks for stopping by today. 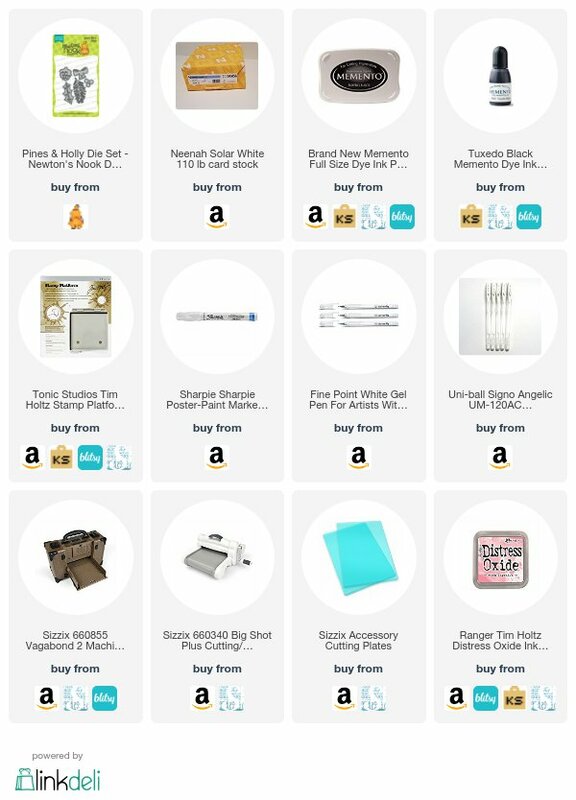 I have listed and linked all the supplies below. Have a great day! It is the last day of the reveals by Newton’s Nook Designs and we saved the best for last by showcasing the Newton’s Sweetheart stamp set and coordinating dies. I love this stamp set so much! I also love the fact that I can use a LOT of pink and hearts, without judgement, haha! I started out by stamping my images on Neenah solar white 110 lb card stock with my memento tuxedo black ink using my favorite Tim Holtz stamp platform. I colored the images in with my Copic markers. For my first card, I die-cut my smooth white card stock with a die from my stash. I added the hearts using the Tumbling Hearts Stencil (revealed last Monday). I adhered the foreground onto my card base and stamped the sentiment with my Versafine ink. I adhered Newton and his sweetheart and finished my design by stamping some small hearts. Here is the first card below. I love the simplicity of it. For my second card, I die-cut a piece of white card stock with a window die from my stash. I colored the negative pieces with my distress oxide inks. I adhered Newton and his cute girlfriend to the window, and stamped two of the sentiments from the stamp set. I used the Tumbling Hearts Stencil die again to add the pink hearts on the top and bottom of the card. Which one is your favorite? Don’t you just love this stamp set? I hope you got inspired this week. I also listed and linked some of the supplies I used. Would you like to win the “Newton’s Sweetheart” Stamp Set? This stamp set will be given away to ONE lucky winner! Comment on the NND blog and Design Team blogs (see list below)! The winner will be chosen at random from the collective reveal posts. Make sure to check out each of their blogs and comment for your chance to win. You will not know which blog has been chosen so the more you comment on the better your chances are of winning! You have until Thursday January 18th at 9pm EST to comment — winners will be announced on the blog post on Friday, January 19th. Cut two pieces of card stock measuring 4 1/4 X 6 3/4, and score 1 1/4 from each long edge. Die-cut a square window from the center of one of the panels (this is your front piece). You will later on connect both panels to create your shadow box. Cut a 4 1/4 square panel of patterned paper and adhere to the center of the second card panel (this is your back piece). (You can do your stamping here before you assemble the box). I used the Newton’s Nook Grass Border die to die-cut the green panels. Adhere some score tape on each scored panels. Fold the ground panels flat, flush to the card’s bottom edge. Fold right side flat over them to adhere. Attach the images you need to decorate your shadow box. Fold box flat and adhere right side flaps to close the card. You can also use acetate sheets to suspend some images inside your shadow box (i.e., birds, clouds, etc.) I hope you got inspired today to create your own shadow box. Would you like to win the “Deer Friend” Stamp Set? This stamp set will be given away to ONE lucky winner! I stamped all of the images on Neenah Solar White card stock and colored them in with my Copic markers. I die-cut the images using the coordinating dies. Would you like to win the “Sending Hugs” Stamp Set? This stamp set will be given away to ONE lucky winner! Here’s a photo of the stamp set. Those little Olives are so adorable, oh my gosh! Can these images get any cuter? They are perfect for Valentine’s Day, or just-because! This stamp set is a must-have. This would be perfect to make some lunch note cards to add to your kids lunch boxes. Which one is your favorite? I had so much fun creating these projects. I hope you got inspired. 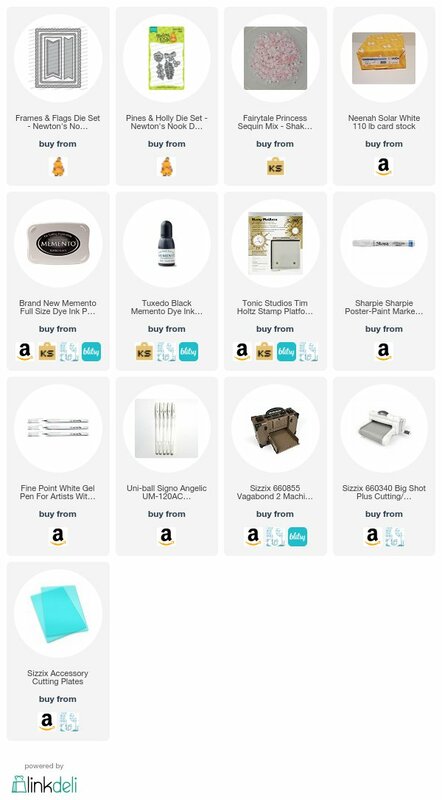 I also listed and linked some of the supplies I used. Would you like to win the “Love Bites” Stamp Set? This stamp set will be given away to ONE lucky winner! Hello my crafty friends. I am back today with a simple Valentine’s Day card, showcasing the Gerda Steiner You’re Koalafied 4 x 6 stamp set and coordinating dies, with the Wonky Wavy Stitched Rectangle Dies, Distressed Edge Rectangle Dies and a bunch of other supplies available at Kat Scrappiness. I have a process video for you today so I will keep this blog post short. I hope you like it. 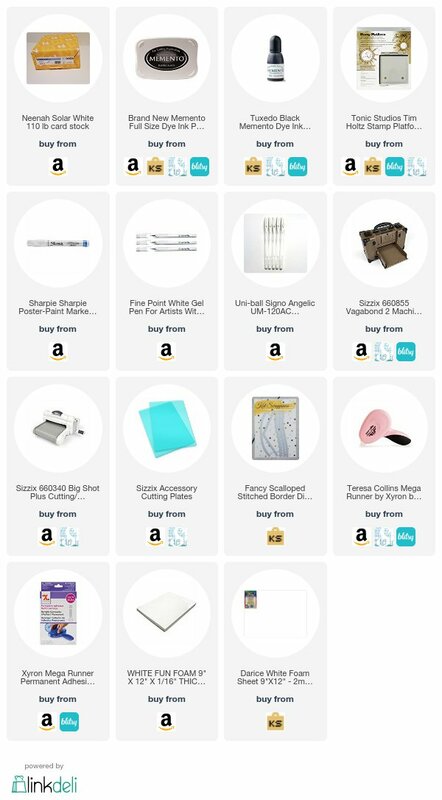 I also listed and linked the supplies I used below. Have a great day! Hello, hello my crafty peeps! I hope you are all having a wonderful day! 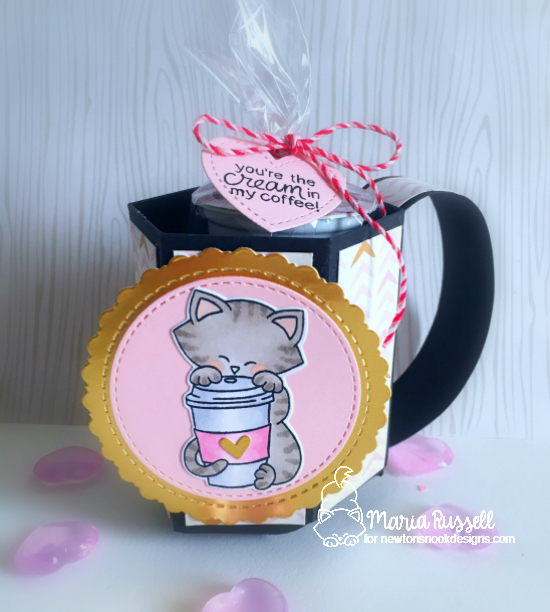 I am back to share with you my projects, showcasing the limited-edition Chocolate Lover’s card kit by Kat Scrappiness. I ABSOLUTELY LOVE THIS KIT! There are so many possibilities using the supplies included in this kit. Here’s what’s inside, plus the two add-ons, which is the Chocolate Lover’s sentiment stamp set and the Wonky Wavy Stitched Heart Dies. For my last project today, I wanted to use the stamp set to decorate a giant Hershey’s chocolate candy bar to give as a gift either for Christmas or Valentine’s Day. I wrapped the candy bar with a plain white typing paper. I used a stamp from my stash to stamp the snowman’s face on the paper, and colored it with my Copic markers. I cut a square and a rectangle black card stock to create the snowman’s hat. I then stamped my sentiment on the hat with versa mark ink, and heat-embossed it with my white embossing powder. I adhered the hat to the snowman. I used my 1/2 inch circle punch to create the buttons for the snowman, and adhered it onto the wrapped candy with my Xyron Mega Tape Runner. To finish my design, I added the red seam binding for the snowman’s scarf, and added the heart embellishment by pebbles, included in the kit. It turned out so cute. You can easily mass-produce this project to give as gifts to teachers, your friendly neighborhood mailman/mailwoman, or anyone else. Here’s my fifth project. Isn’t he cute? I hope you like all of the projects that I created today and got inspired. The supplies I used are listed and linked below if you are interested. Have a wonderful day! 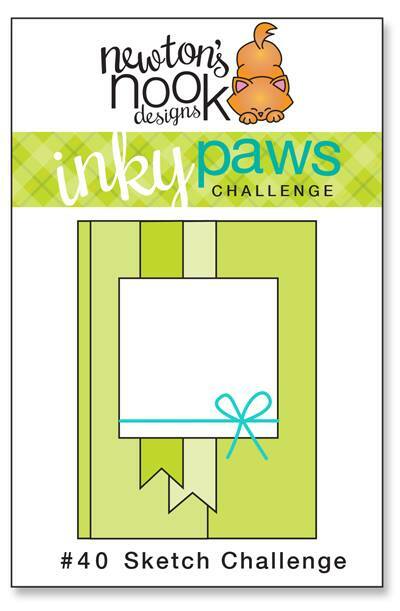 There’s a new Inky Paws Challenge on the blog (http://www.inkypawschallenge.com) and this time it is a sketch challenge. I love sketch challenges! It gets me out of my comfort zone to try and design something that I’ve never done before. I started out by stamping the images on Canson watercolor card stock with my Versafine Onyx Black Ink and colored them in with my Zig Clean Color Real Brush markers. For this card, I am showcasing a couple of stamps from Newton’s Nook Designs. 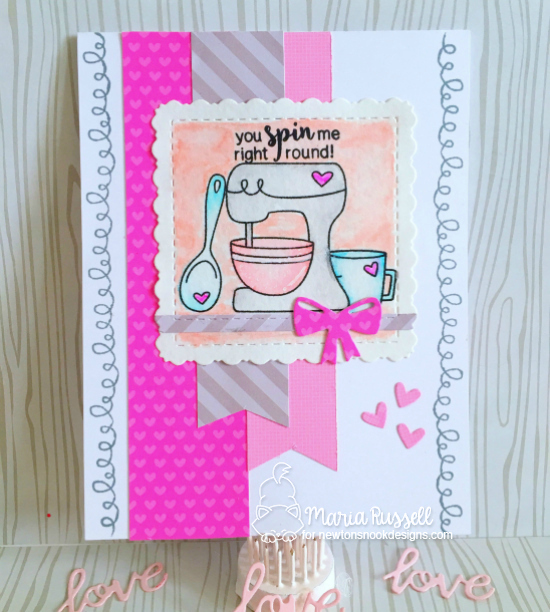 The mixer, spoon and measuring cup are from the Made From Scratch stamp set and the doodle design is from the Love A La Carte stamp set. I finished my design by using some Doodlebug patterned paper. Instead of using twine, I decided to use the bow from a Christmas die-set by NND called Pines and Holly Die Set. Here is my version of the challenge. What do you guys think? I hope you got inspired today and join us for this challenge. For more information, please visit http://www.inkypawschallenge.com. You have two weeks to join the challenge. Winner will get a $10 gift code for the Newton’s Nook Designs shop. The supplies that I have used for today’s card are listed and linked below if you are interested. Have an amazing day. Hello stampers and crafters! Thank you for stopping by my blog. Welcome to the sweet treats blog hop hosted by Newton’s Nook Designs. I have a special treat for you today. I am sharing two Valentine’s D.I.Y projects. The first project is a unique holder for your love letter. I call it, Message in a Bottle. I made this project a few years ago and posted it on my YouTube channel. 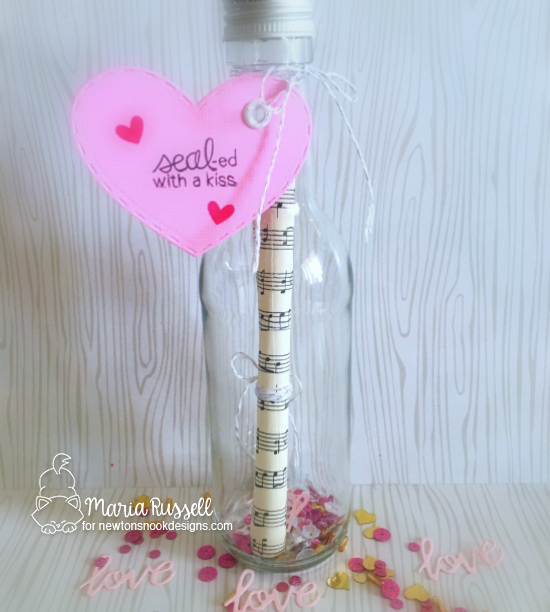 Back then, I wanted to give my husband something unique on Valentine’s Day so I made this cute, shabby chic message in a bottle project that housed a music sheet by Led Zeppelin, called “Thank You”. This was the very first song that my husband played for me on the guitar when we were still dating many, many years ago. However, the Message in a Bottle project that you see below is a lot simpler. If you are looking for a unique project this Valentine’s Day, the possibilities are endless using this idea! I started out by cleaning up a small empty wine bottle and set it aside to dry. 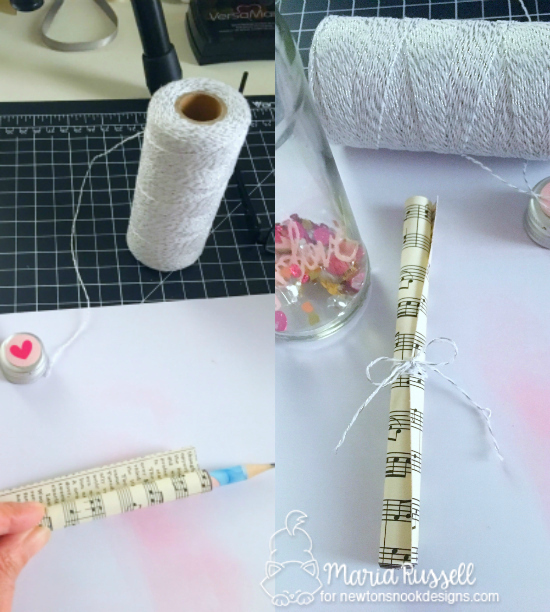 For my example below, I used a music sheet patterned paper (Note: You can write your own love letter instead) I rolled the patterned paper using a pencil to make it easier for me, then tied it with a bow. To add interest to the message holder, I added the love die-cuts using Newton’s Nook Designs Darling Hearts Die. 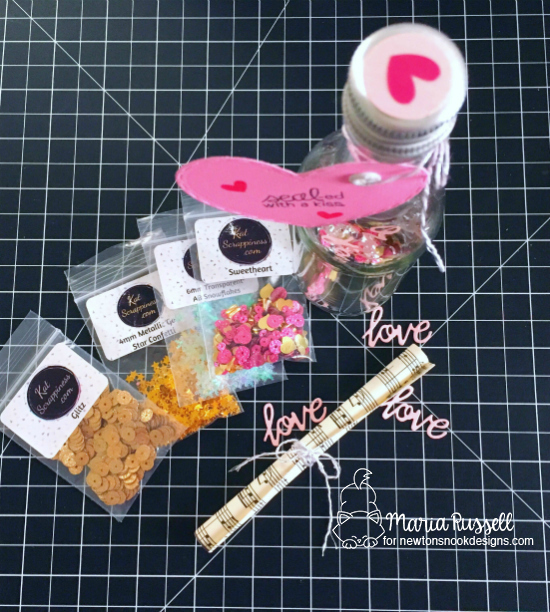 There is a small “love” script die that is included in this set and is perfect for this project. I also used some of my favorite sequin mixes to further decorate the bottle. This is like a shaker card, without having to use foam adhesive. I think it turned out so cute! To finish off the design, I die-cut the heart tag using the Darling Hearts Die on pink patterned paper. I used the sentiment and the heart from the Holiday Smooches stamp set. I used my crop-a-dile to turn the die-cut into a tag. I tied it on the bottle with my silver twine. Don’t you just love this unique love letter holder? 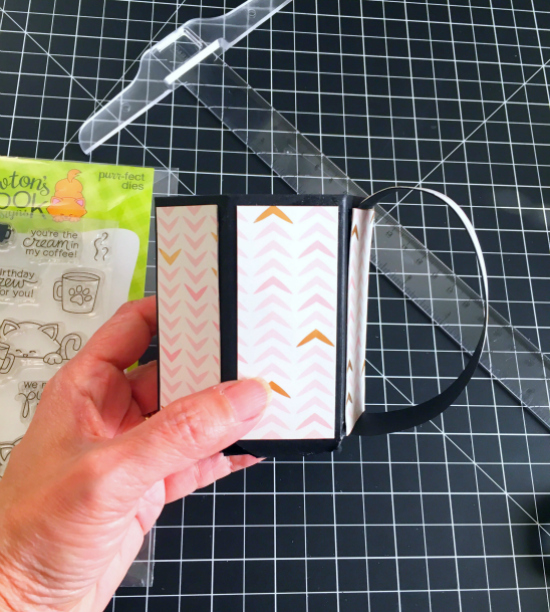 The second project is an adorable paper mug treat holder idea, using the We R Memory Keepers Punch Board. This Punch Board is one of my all-time favorite crafting tools because of its versatility. You can make your own envelopes, treat boxes and treat holders. I followed a video tutorial on YouTube on how to create this Paper Coffee Mug. Since this project is for Valentine’s Day, I wanted to use White, Pink and Gold for my project. I used a beautiful patterned paper that I got from Michael’s to decorate my paper mug. I then stamped this cute Newton image (from the Newton Loves Coffee stamp set) on Neenah solar white card stock and colored him in with my Copic markers. I used the coordinating dies to die-cut the image and adhered him to a pink circle card stock. I die-cut the scallop circle with my stitched fancy scalloped circle die to further decorate my tag. I love the pink and gold color combination. I bought some of my favorite Keurig coffee pods and I put them inside this clear cellophane bag. To finish wrapping up my package, I used my sweetheart twine to close the bag, and stamped my sentiment on this pink heart tag die, and tied a bow. 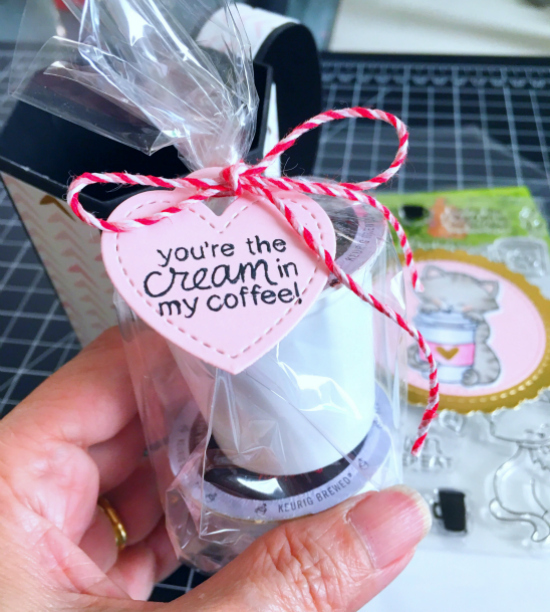 I love this paper mug treat holder to package up some favorite coffee pods. Would you like to win a $10 store credit to Newton’s Nook Designs online shop? We are giving them out to TWO lucky winners!